Die C1541-Floppy besitzt zwei Bausteine des Typs MOS 6522 wovon ersterer (ab 1800hex) zur Datenübertragung mit dem C-64 dient, zweiter (ab 1C00hex) zur Ansteuerung der Motoren und Schreib-/Leseköpfe. Pin 2-9 PA0-PA7 I/O Parallel port a signals. Bidirectional parallel port. Pin 10-17 PB0-PB7 I/O Parallel port b signals. Bidirectional parallel port. Pin 21 !IRQ O Interrupt output to microprocessor input IRQ. 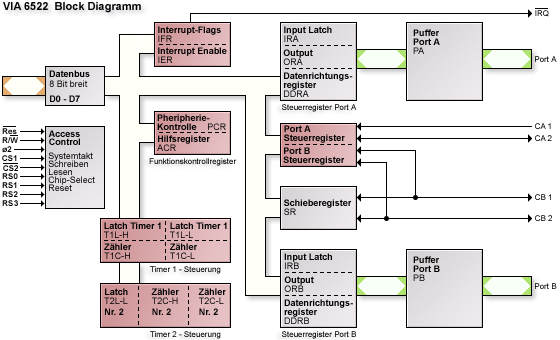 Pin 26-33 D0-D7 I/O Bidirectional data bus. Connects to processor data bus. Pin 34 !RES I Low active reset input. Initializes CIA. 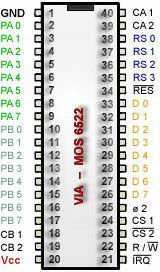 Pin 35-38 RS0-RS3 I Register select inputs. Used to select all internal registers for communications with the parallel ports, time of day clockand serial port (SP).